7 min to 71st Ave E, F express Subway & LIR 7 BR 5 & 1/2 bath EIK Large Family Rm. Sunny Solarium. Bth w/ Sauna Jacuzzi large Gardens. 7 min to 71st Ave E, F express Subway & LIR 7 Bedrooms 5 & 1/2 bathrooms Eat In Kitchen ..
3 Bedroom Eat in kitchen, 3 bathrooms (1 full bathroom and 2 x 1/2 bathrooms) Finished walk in Basement w/ ..
3 min to 75th Subway move in condition PS 101 5 bedroom 3 bathroom (1 full bathroom + 2 x ..
Large 2 Bedroom 2 Bathroom Finished Walk in Basement with Family Rm, Bathroom, laundry. Basement Garage. 1st F: Living Room, .. Entire 2nd Floor, 1000+ sq feet. $2299 per month including water. Washer and Dryer. Working original fireplace. Supermarkets, ice cream shops, organic market, frozen yoghurt, real French bakery, restaurants, bars, diners, sustainable restaurants, Chinese bakery, bubble tea, fast food, coffee shops, movie theaters, boutiques, medical clinics. Brick 2 Family. (Converted from 1 Family). Lot 19’x100′. 2 Bedrooms + Bath 1 Bedroom + Bath Studio + Bath .. 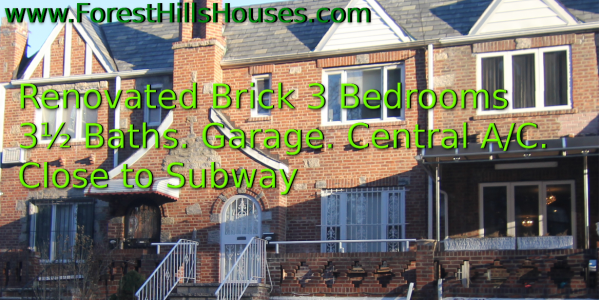 Brick 3 Bedrooms 3½ Baths. Close to subway. Garage. Central A/C. Rego Park.